A couple of months ago a friend gave me this embroidered silk fabric in a bundle of silk fabrics she was discarding from her stash — a real find for me. 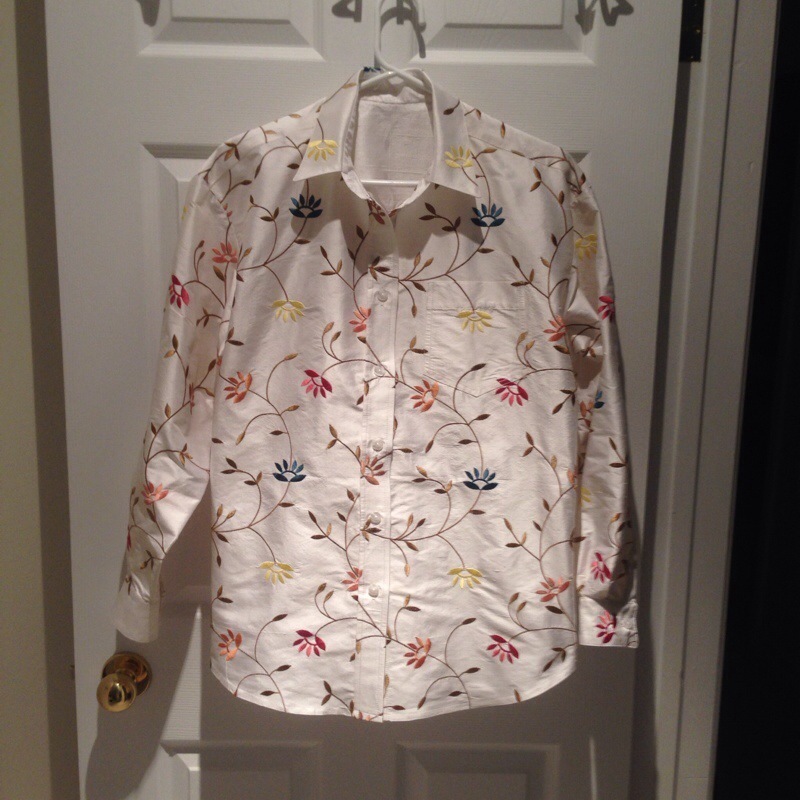 This one I immediately thought would make an “elegant” shirt jacket (two of the other pieces are earmarked for a quilt). So two days ago I finally cut the shirt out, being careful to match the sleeves, the two fronts, the cuffs, and especially the pocket. The under collar, inside collar stand, inside of the cuffs are done in a solid white silk dupioni which I bought through Etsy. The real accomplishment was matching the two fronts across the front placket! It really was a lucky accident – because I was careful about matching the embroidery across the two fronts, it happened that the lines aligned across the placket. And the pocket matched exactly the embroidery beneath. 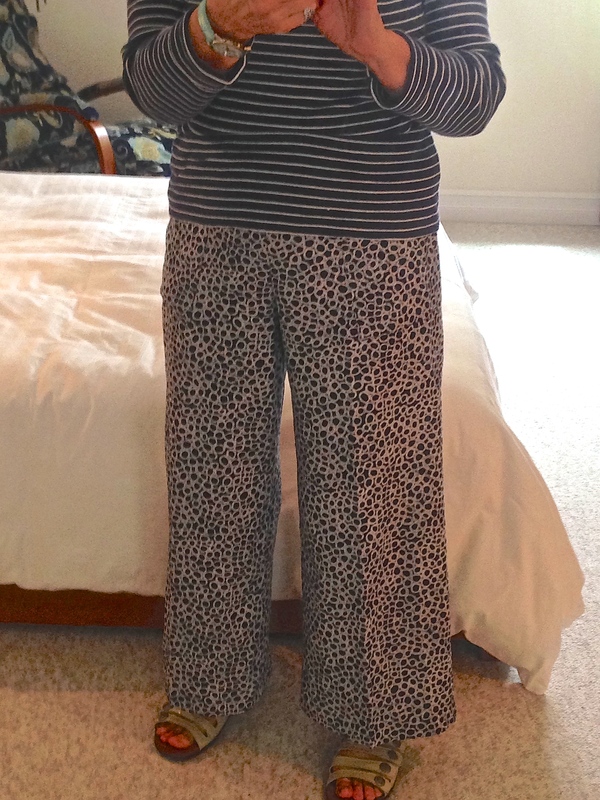 I plan to wear it with a shell underneath, and white pants, I think, at one of the family bar mitzvah gatherings. Cutting and assembling this quilt wasn’t the challenge; figuring out how to quilt the “blocks” was. In the end I set up an 8×8 design – 20 blocks in all (leaving some of the sashing unquilted), thirteen 3×8 blocks, two 3×3 blocks and then a design for the border. This quilt has turned out a wee bit larger than my usual lap quilts – the design forced that – had to use an even number of blocks to make the lattice symetrical. Ok, so the point is to use up the stash of yarn left-overs, to stretch them out with interspersing them with a blending colour yarn, pick up a colour in the blend for cuffs, heels and toes. But in this case it has resulted in a very boring pair of socks! 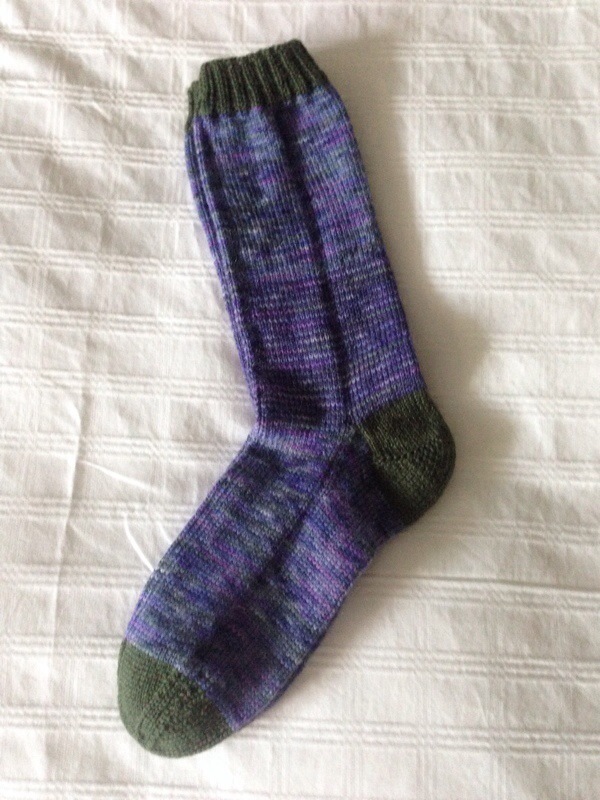 It was so boring it was all I could do to finish the second sock. Oh well, someone will love them. They’re now in the give-away pile (which continues to grow – gotta start giving those socks away). Last evening I attended a lecture by Kaffe Fassett. 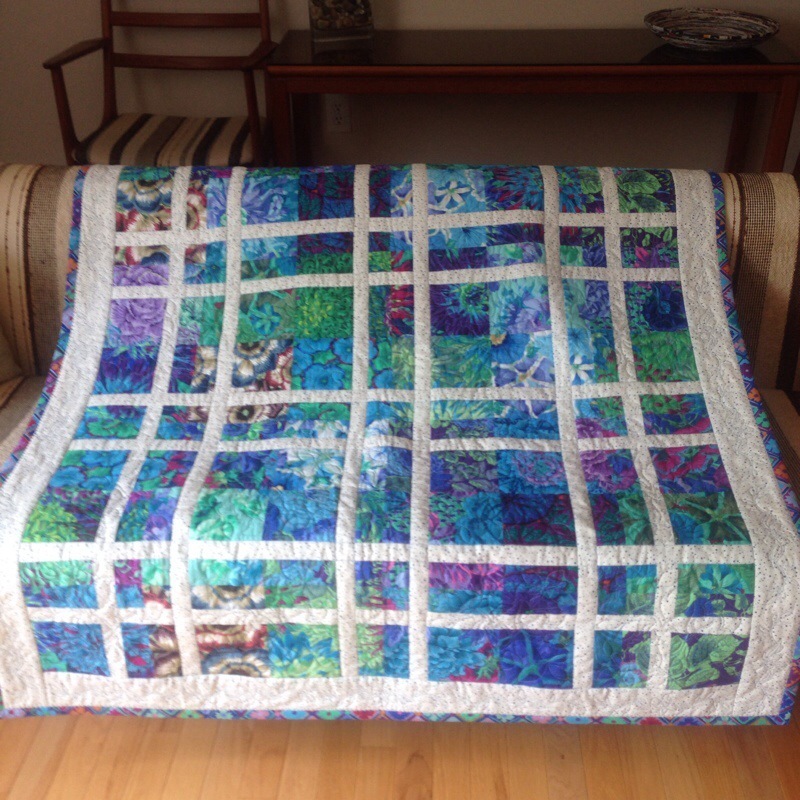 Three of the local quilt guilds decided to work together and sponsor his visit to Nova Scotia. His talk was about “colour” – I’ve been following his work for years, beginning with his knitting books. 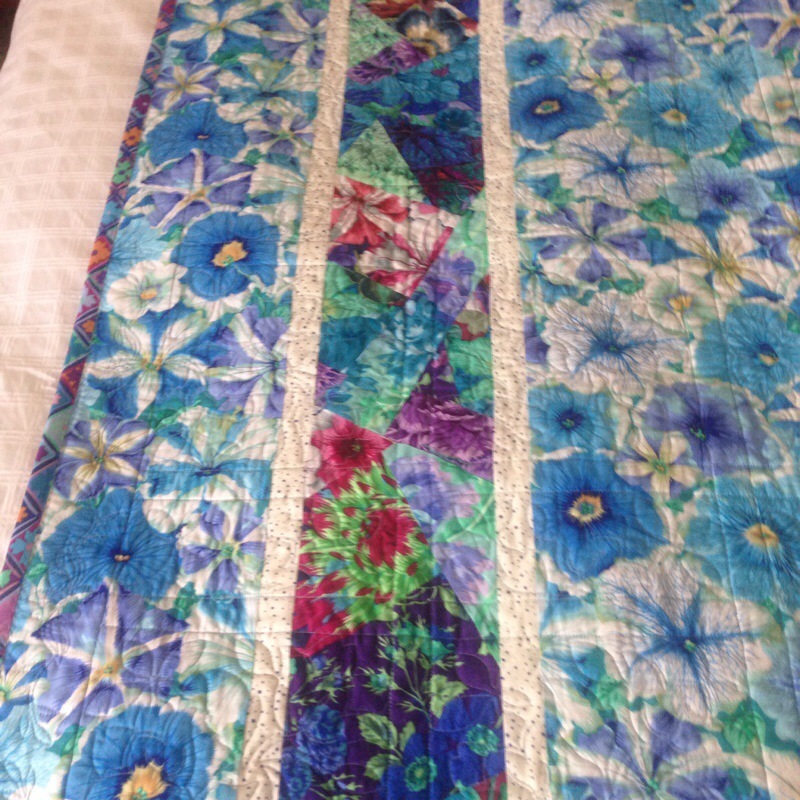 His latest work has been quilts using fabrics he designs for Westminster Fabrics. After the purge of my house last week, including the sewing room (I got rid of a lot of fat quarters and scraps I knew I was never going to use), I promised myself I was NOT going to buy any fabric — NO FABRIC, until I saw those luscious flowers in gold, pink, pale green, turquoise. And beside that bolt was the green dots, and then the pink houses… I added in the strong pink circles and a couple of others, bought a half meter of each. 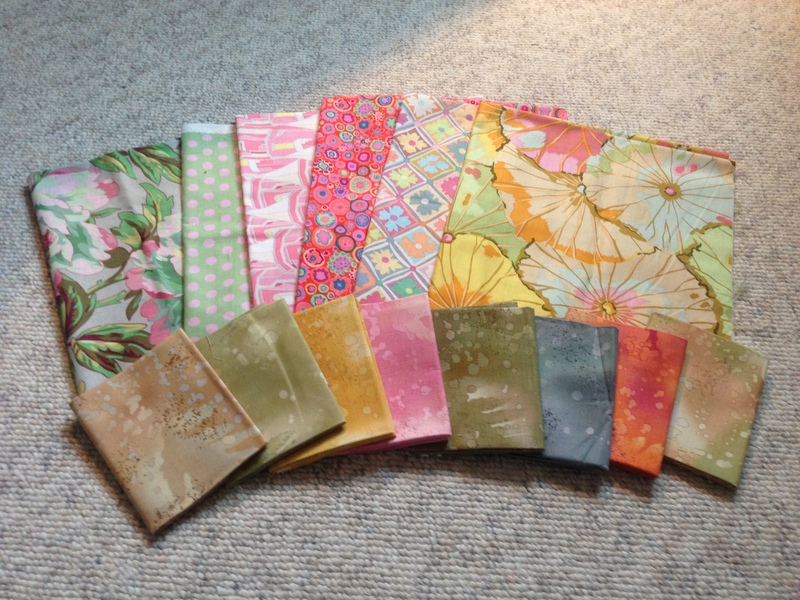 Then I came home and went through my Fossil Fern fat quarter collection (I still have about half of them unused) and picked out eight that I thought would work with the Kaffe Fassett prints. These are more subtle than my usual quilt fabrics in shades I don’t usually gravitate toward, but last evening they called out to me. I have no idea what kind of quilt I will make with this fabric collection. It might be several months before I think about using them but something interesting will get made. 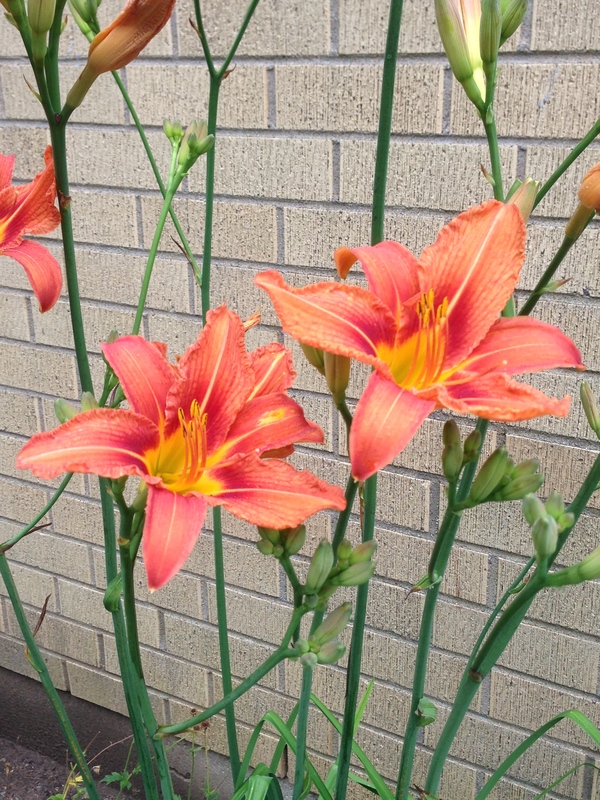 We’ve got day lilies in one of the garden beds across from my town house. They’ve been blooming for the past 10 days or so. This plant is thriving this year with a gazillion blooms to come. The women on the Bali trip have been talking about how to recognize one another in the Denpasar airport when we arrive. We’re coming from both the east and west coasts and from locations in between. Some travelling west, I’m traveling east. Several of us are arriving at about the same time in Denpasar. Since most of us don’t know anyone else on the trip, the suggestion was made to create luggage tags in a lime green so we can identify another trip member at the luggage pick up. Seemed like a good idea. So yesterday I whipped up a couple of luggage tags – one for my suitcase, and one for my backpack (which I will be wearing). Very easy to do. Cut 4 pieces of 3.5″ x 5″ fabric as well as 2 pieces of 3.5″ x 5″ heavy weight interfacing, two 6″ lengths of grosgrain ribbon and two 3.5″ x 5″ pieces of plastic. Fuse the interfacing to two of the pieces of fabric. Place the other two pieces of fabric on the right side of the fabric/interfacing piece and sew on three sides. Insert the folded grosgrain ribbon (cut ends) into the open end which has been folded inward. Stitch the open end closed. Take a business card (or a card with your ID on it) and lay it in the middle of one side. Place the plastic piece on top and stitch around the outside, then stitch around the edge of the card. Trim the plastic as close to the seam as possible. And there you have it – a personal luggage tag – won’t look like anybody else’s!